WinServ™ | Integrated Systems Associates, Inc.
WinServ is an extremely powerful database search engine that enables users to merge multiple Clippership® history files spanning over days, weeks or even months! Search results are displayed in a grid-like manner, similar to MS Access or Excel, which can be easily customized with it's administration tools. All WinServ 3x versions or greater come bundled with its own internal web browser. 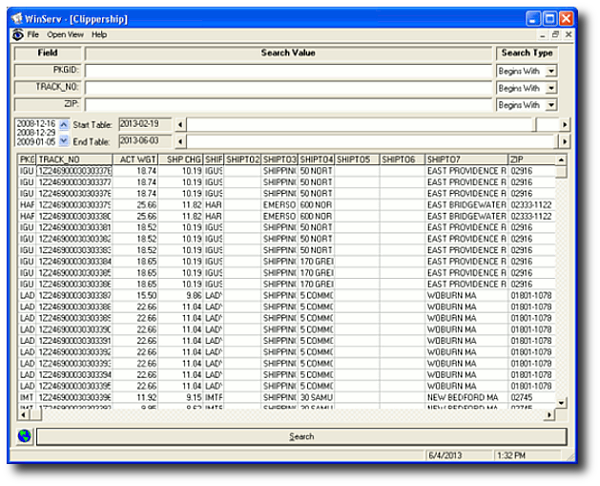 This enables users to search & track virtually any Clippership package without switching between programs. Create multiple data views so that your users will only search through data that's important to them. Not just for Clippership! Feel free to use WinServ to search virtually any Microsoft Access, dBase formatted files or ODBC connections to other database types. Export search results to an Excel Spreadsheet or Text File (CSV) for reporting, totalizing or historical information. System administrators can use the password protected WinServ Administration Tools to create & edit search views. Within these views, fields may be set as a "searchable" and/or "trackable" field. We are pleased to inform you that WinServ™ is developed & maintained by our own in-house engineers. We pride ourselves in providing outstanding software with the highest level of customer support.